The third time was a charm for an Indiana State University student. In just her third pageant competition, Paoli junior Kyla Eubank punched her ticket to compete for Miss Indiana in June by claiming the 2013 Miss Indiana State University title. She entered her first pageant in sixth grade. "I ended up winning that one," Eubank said. She entered another pageant as a high school freshman and finished first runner-up. Then she decided to compete for Miss ISU. "I'm glad I waited so long to compete again," Eubank said. "I didn't want to be too rehearsed. I wanted them to see the real me." Competing against eight young women proved to be not only fun, but an opportunity to expand her circle of friends. "All the contestants were very talented," she said, adding she was secretly comparing her efforts to the eight others vying for the crown. "I had mentally prepared myself that I wasn't going to win any of the individual awards," Eubank said. She not only won the crown, but walked away with the People's Choice Award, sharing top honors for interview and winning preliminary evening gown and healthy lifestyle in swimsuit. "To be chosen to represent ISU at Miss Indiana is a dream," Eubank said. "And I truly appreciate that." During her year of service, she will serve as an ambassador for the university while balancing her studies and her involvement with "The Forest," ISU Student Government Association's student cheering section for Sycamore athletic events, and Sigma Alpha Lambda honors fraternity. But there's work to do before competing for the Miss Indiana crown. In the months leading up to June, Eubank will work on her interview skills, work out with a personal trainer and will develop her talent. Eubank, a textiles, apparel and merchandising major, played piano for the talent portion of the competition. It was a talent she picked up after a long absence. "When I was little, I begged my mom for piano lessons," Eubank said. "I quit a couple of times. I decided I wanted to pick it back up last year." Eubank contacted Indiana State's School of Music who put her in touch with faculty member Lynette Browne, who worked with her twice a week for six weeks. "Lynette and her student, Jessie, worked their magic," Eubank said. "I was really confident and I worked as hard as I could. And if I messed up, I practiced my poker face." Eubank is still taking lessons from Browne and they are working on a new piece for her performance at Miss Indiana. As she prepares for Miss Indiana this summer, Eubank will interact and raise money for the Children's Miracle Network and will raise awareness of her personal platform "Educating future generations to reach their greatest world." "It's more than academics," she said. "It's about accepting differences as well. We need to accept everyone's differences and enjoy the beauty of that." The Miss ISU Scholarship Program began in 1958, and Eubank is the 31st winner, receiving a $1500 scholarship. She will now begin preparing for Miss Indiana, which takes place in June 2013 in Zionsville. 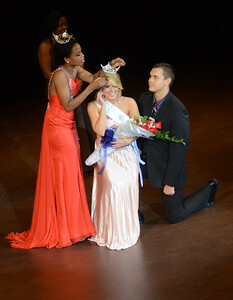 The Miss Indiana Scholarship Program is a preliminary for the Miss America Scholarship Program.